Calling all entrepreneurs! Get ready for Vator Splash SF! Win the chance to present on stage at Splash SF on February 13 in San Francisco in front of some 400 business professionals, comprising of executives from startups and large companies, angel investors, VCs, and media. Also win a chance to meet with top-tier VCs. The Splash winner receives one-hour sit-down meetings with Alsop Louie Partners, Javelin Venture Partners, Floodgate, and Morgenthaler Ventures, the early-stage VCs behind Evernote, Lending Club, and Siri. 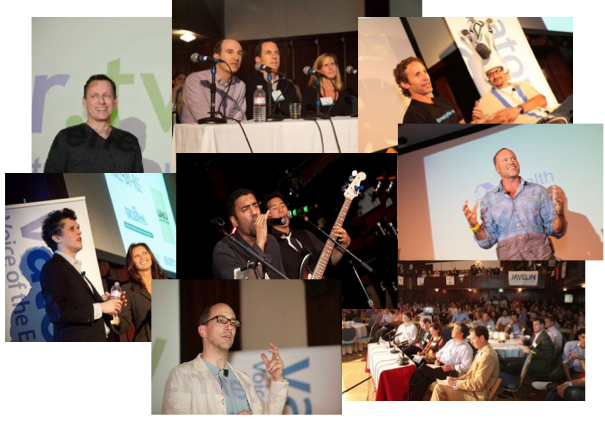 To win the VC sit-down prize, you must be one of the top 10 hot startups to showcase at the event. To be one of the top 10, you have to apply to this competition and be vetted by judges. To qualify you must be under 3 years old, and have raised no more than $1.5 million in funding. Even though success is not defined by how much money a company has raised, DogVacay, Getable, Thumbtack, Astrid, Udemy, Plink and Geeklist, to name a few, have gone on to raise millions of dollars collectively from venerable VCs, soon after presenting at Splash. "Having the opportunity to demonstrate Apartment List at Vator Splash and talk about our vision to an audience of top-tier VC investors and entrepreneurs was an exciting honor. Bambi and team put on an great night of Silicon Valley networking. We made meaningful connections at Splash as well as on Vator that are proving fruitful for our business, and winning the start up competition was icing on the cake. Thanks Bambi and team for creating a great investor and entrepreneur community and packing the house with a fantastic audience at your events," John Kobs, CEO and co-founder of Apartment List. "At Vator Splash, I made great connections with a number of investors and had a number of follow-up meetings. We were able to raise our last round entirely from investors who discovered us from the publicity we generated from Vator Splash," said Jon Paris, CEO and founder of Astrid. "Working with Vator, and Bambi, is a pleasure. She's really passionate about uniting great ideas with the right people. We actually tied for first in last years Vator Splash SF and as a direct result raised $150,000 from an investor who saw us pitch. TEEC Angels approached us right at the event and invested soon thereafter. Reuben Katz, CEO and founder of Geeklist. "Events like Vator Splash are critical for startups to generate awareness. We were a top 10 finalist for Splash LA. It provided us with an amazing opportunity to network and gain exposure to a whole community of investors and VCs. Soon after, we raised $3M as a result of the momentum/exposure from the event and the platform in general." Peter Vogel, founder of Plink. For details about how to win, see round details section. What do the top 10 finalists win? The opportunity to give a three-minute presentation onstage. A professional video of their presentation produced by Vator. A free ticket to the event, and discounted tickets for their network. Discounted tickets for future Vator events. A bottle of wine. Free back-office consultation and work courtesy Backops. Other in-kind prizes TBD. The Splash winner (voted by judges) and People's Choice winner (voted by the audience) get: Same as top 10, a magnum of wine, courtesy Manifesto; a demo table at the next Splash event; Discounts to Vator events; opportunity to be an online judge for the next Splash and other goodies. Two-hour accounting consultation courtesy KPMG; An one-hour sit-down VC meeting with Javelin Venture Partners, Floodgate, Alsop Louie Partners and Morgenthaler, the early-stage VCs behind Evernote, Lending Club, and Siri. The Splash winner also wins an Apple iPad. Vator Splash is hosted by Bambi Francisco. Investors from top VC firms, such as 500 Startups, Alsop Louie, Andreessen Horowitz, AngelPad, AOL Ventures, August Capital, Battery Ventures, Bessemer, Betaworks, BlueRun, Bullpen Capital, Blumberg, Canaan, Claremont, Crosslink Capital, DFJ, Emergence Capital, Felicis, First Round, Founders Fund, Freestyle Captial, Greycroft, Greylock, Google Ventures, Hummer Winblad, IVP, Industry Ventures, IDG Ventures, Javelin Ventures, Khosla Ventures, Lightspeed, Mayfield, Morgenthaler, North Bridge, Polaris, Redpoint, RRE Ventures, Rustic Canyon, Shasta Ventures, Softech VC, SV Angels LLC, Norwest, NYC Seed, Scale, Technology Crossover Ventures, Techstars, Venrock and more will be attending or have attended our events. Start-ups must be three years old or under. Start-ups must not have raised more than $1.5 million in funding. Start-ups must apply with a company profile on Vator. The popular vote determines the top 15 to 20 finalists. The number of finalists are determined at the end of the round. Voters are limited to one vote per Participant for the entire competition. Participants may vote for their own company. Vator and the contest organizers have the right, in their sole discretion, to take whatever action they deem appropriate to uphold the integrity and reputation of Vator, the organizer and the competition, including the right to disqualify companies, void votes, or recalculate votes, in the event of, but not limited to, multiple votes from the same user from different IP addresses, or votes considered fraudulent, technical failures, errors or problems occurring with the site and/or Internet services, failure of judges to perform their duties, proxy voting or payment for votes. Vote weight: 10% popular vote from previous round and 90% judges. Does this product/service solve a clear market problem? Is it a new and novel approach to solve a problem? Is there enough differentiation that gives this idea a fighting chance against competitors? Is the market a big macro opportunity? Does this startup have a clear market niche and user group? Did they indicate clearly their go-to-market strategy to attract users? Did they clearly articulate their business model? Did they demonstrate how they will compete effectively? Is this business a venture-backed opportunity or a life-style business? Is the team relevant to the opportunity? Does the team have the expertise to succeed? Is the team clear about the objectives? Can the team convey the opportunity? Josh invests in early stage companies with a focus on marketplaces. Josh was early at oDesk and filled many roles over 5 years. Josh was also the head of product and marketing at AdRoll. Online Travel Industry Expert (17yrs). Former VP Biz Dev for Travelocity. Inventor with one issued travel patent and two more pending. MBA from the Harvard Business School. Trevor began his venture capital career in 1997. Prior to co-founding Correlation Ventures, Trevor was a Managing Director of Newbury Ventures, a technology-focused venture capital fund. Bill is an angel investor and some of his recent investments include Tesla Motors (nasdaq: TSLA), Posterous, Tweetdeck (acquired by Twitter), Kelkea (acquired by Trend Micro), and Zaarly. Ranked #23 out of 100 top tech investors on Forbes’s 2015 Midas List, Rebecca Lynn is a Partner at Canvas. She focuses on early-stage venture investments in FinTech, digital health, SaaS, and mobile. Rebecca led Canvas’s investments in FutureAdvisor, CrowdFlower, HealthLoop, and Viewics, and currently sits on the boards of each. In 2007, Rebecca joined Morgenthaler Ventures and continues to serve on the boards of that firm’s portfolio companies. She led an early-stage investment in Lending Club (NYSE: LC), which was the largest US technology IPO of 2014 and the fourth largest US Internet IPO since 2001 behind Facebook, Twitter, and Google. She also led investments in Check (acquired by Intuit), RelateIQ (acquired by Salesforce), Doximity, Practice Fusion, and Convo. Rebecca is a board member of Lending Club, Doximity, Convo, and a board observer of Adara Media and Socrata. Rebecca is a native of the Midwest, born and raised in Missouri and worked in Ohio for her first job out of college. She began her career at Procter and Gamble’s corporate headquarters in Cincinnati where she launched new products internationally. She then joined NextCard in the San Francisco Bay Area as employee number 30, and rose up the ranks to become VP of Marketing and head of customer acquisition. During her four years at NextCard, Rebecca led product development efforts and managed one of the top-five largest online marketing efforts of that time. NextCard was the first online credit card company, and it went public in 2000 with a $1.3B market cap. After NextCard, she ran her own consulting business focused on online marketing for financial services and affiliate marketing. Rebecca is a member of the California Bar Association and a member of the US Patent Bar, with a focus on intellectual property litigation and corporate law. She was published in the Berkeley Law and Technology Journal. Rebecca is also an inventor on several issued patents. She has a chemical engineering degree from the University of Missouri and a JD/MBA from the University of California at Berkeley. She is active on the boards of the Economic Innovation Group (EIG), UC Berkeley’s SkyDeck, and Signature Innovation Fellows. Harshul Sanghi is the managing partner of American Express Ventures, Enterprise Growth at American Express, with extensive corporate venture and mobile experience and relationships. 20 years in/around startups. Currently building Agile Credit to solve the multi-trillion dollar small business credit gap. Mentor @ SeedCamp, 500 Startups and various corporate innovation groups.